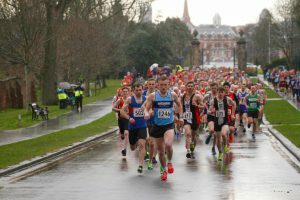 The event of the week was the first Inter Club race for 2018 in Blackpool’s Stanley Park but there was a challenge with the weather with a cold and wet evening. Undeterred Wesham’s Rob Danson was untouchable form the start as he ripped up the course and won in 19:54 over the measured 4-mile 2-lap circuit. The Wesham men had a great front squad as Steve Swarbrick took 5th place with 21:37; Steve Littler 7th and 1st M40 (3rd master overall) timed at 21:55, and David Taylor coming in 16th with 22:59. Lee Barlow ran strongly to finish 21st and 7th Over-40 in 23:10 passing and holding off Steve Waterhouse 27th and 10th O-40 in 23:22. Stephen Abbott was 34th in 23:52 (13th O-40); Arron Galvin came in 41st in 24:06; and Mark Belfield 47th with 24:21. Tess Robinson won the women’s race in 24:40 (53rd overall), with Helen Lawrenson 5th in 26:55 (103rd overall). Gemma Owen had a great run to finish 7th with 27:16 (113th) and Sue Coulthurst finished 15th in 28:14 (142nd) and Emma Lund 17th in 28:36 (149th). The Wesham open team with Robinson scoring placed 2nd behind winners Preston (252 to 192), and the women also finished 2nd with 45 (winners Blackpool with 38). The Women Masters team were also 2nd (Lawrenson 3rd; Coulthurst 7th; Carmel Sullivan 10th (29:51; 24th); Kath Hoyer 16th (30:46; 33rd) and Sharon Cooper 19th (31:29; 36th). The Wesham Overall Masters won with 56 (Swarbrick 2nd; Littler 3rd; Barlow 7th; Waterhouse 10th; Abbot 13th and Robinson 21st) with Preston 2nd (66). In the Masters’ Over-50s Wesham were 6th team with John Collier 19th (27:23; 116th) Peter Cruse 23rd (27:41; 127th); Sue Coulthurst 28th and Alan Hudson 35th (28:48; 158th). The Over-60 team finished 4th with Collier 7th; Hudson 14th; and Dave Marsland 15th (29:14; 169th) with 36; Red Rose won with 15. Rob Danson was awarded overall champion of the 2017 Grand Prix at the annual presentation after the race in the Blackpool Cricket Club; and the Wesham ladies won the Women Masters team. James Mulvany was 10th taking 7th Senior and David Taylor was 10th. Helen Lawrenson was 3rd W45; Carmel Sullivan won the W50; Steve Myerscough 2nd M40; Garry Barnett 3rd M50; Nigel Shepherd 3rd M55; John Bertenshaw was 3rd M60; and Alan Hudson was 2nd M65. Rob Danson finished 5th in the Podium 5km “A” race on Saturday at Barrowfield with a time of 14:48. The winning mark was 14:19 by Tom Lancashire (Bolton). Gemma Owen was 27th in the “B” race (9th woman) with a new personal best time of 20:15. The winning time was 17:29 (Andy McCue of Skyrac). The Wesham Trail Running Championship continued on Sunday at the Rivington 10-mile Trail Challenge. Lee Barlow finished 10th and 3rd M45 in 1:15:11 with the course extended to 10.5 miles with a tough uphill climb towards the end. Paul Gregory was 17th with 1:17:23, and Simon Denye 22nd and 2nd M40 in 1:18:51. Steven Gore finished 27th in 1:19:47; and John Collier 66th and 1st M60 in 1:28:43. Helen Lawrenson placed 11th woman and 69th overall in 1:29:04, 3rd W45; Thomas Farquhar 117th with 1:35:20; Kath Hoyer 135th and 3rd W55 in 1:37:16; Gemma Owen 145th with 1:38:07; Rob Danson (Snr) 201st in 1:47:16; Maureen Danson 240th in 1:55:48; Anne Berry 243rd with 1:56:42; Finlay McCalman was 247th in 1:57:12; and Tanya Barlow 253rd in 1:57:50. Steven Gore skipped the Inter Club Grand Prix and ran the 5km of the second of the 2018 Curlys series. He finished 8th in 22:10 over the challenging trail course up towards the Two Lads. Vicky Gore finished 68th and 4th W40 in 30:07. Daniel Shaw completed the Kielder Ultra 50k race and placed an excellent 4th position with a time of 4:20:54. Ugis Datavs finished 4th in the Glasgow to Edinburgh Ultramarathon, completing the 55 miles of Forth and Clyde towpaths, the Antonine Wall and the Falkirk Wheel in a time of 7:37:18. In the Manchester Marathon Diane Blagden finished 1838th woman and 7093rd overall in 4:40:41, 134th W50. Fran Hodskinson completed her debut marathon with 4:26:40 in 6247th place; and she was 1446th woman and 180th W45. Rob Wallace was 5026th overall in 4:08:06, and Ben Wrigley ran well to finish 4184th in 3:57:30, 673rd M35. Alistair Morris ran the Lancashire Fell Championships on Saturday incorporated in the Pendle Fell Race from Barley village over 4.5 miles and 1499ft ascent. He finished 175th and 33rd M50 in 1:10:54. There was a big Wesham turnout again at the Lytham Hall parkrun. Arran Galvin had the third fastest time of the morning with 18:47 for an M35 age graded performance of 71.07%. Car Groome ran 19:29 for an M45 grade of 75.11%. Andrew Harling clocked 20:11 for M35 66.14%; Jonathan Lawson 22:28 for M50 65.65%; Kay Twist 24:28 for W45 66.89%; Phil Leaver ran 25:04 for M60 66.29%; Michael Hall 25:34 with M40 54.63%; Graham Cunliffe 25:49 for M60 62.69%; Paul Eccles 26:02 and M35 51.28%; Pauline Eccleston 27:14 and W45 59.49%; Andrew Moore 27:23 with M55 56.60%; Finlay McCalman 27:29 and M50 55.43%; Kerry Eccles 30:35 with W55 59.18%; Julie Rooney ran 30:35 and W40 51.06%; Stuart Topping pace-making to 33:19 with M45 43.22%; Jennifer Woodman 33:32 and W35 44.58%; Nicola Carter 35:07 with W35 42.71% accompanied by Jason Blagden in 35:09; Sue Rigby clocked 37:01 with W40 42.50%. In the Preston parkrun Robert Brown ran 25:38 for M60 62.55%. Chris Pike ran St Helens with 26:40 for M40 52.38%. In the Blackpool Stanley Park run Helen Lawrenson bagged 21:35 for W45 grade of 75.83%; Dave Marsland an M60 72.73% with a time of 22:26; Martin Bates M60 69.01% and 23:27; Sara Ward 24:42 for W50 69.57%; George Kennedy 25:48 and M60 62.14%; Dave Young ran 26:33 for M70 66.42%. The Wesham parkrun tourists visited Bakewell in the south-east Peak District; an out and back on the Monsal Trail on the old Midland main line to Manchester; David Taylor scored the third fastest time of the morning with 17:52 for an age grade of 72.57%. Vicky Gore had the lead with 26:39 for W40 58.16%, with Megan Gore JW11 50.25% with a time of 33:06, and Steven Gore tailing with 33:07.